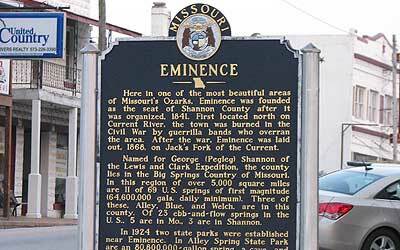 Eminence is the Shannon County seat. The original town site was burned by Union soldiers in 1863, and the settlement was subsequently moved to a central location within Shannon County. Eminence experienced a population swell in the early 20th century when the Missouri Mining and Lumber Company established a sawmill in the west part of town. Eminence has four distinct seasons to enjoy. The mild winters give us an annual average of 14 inches of snow. Average lows in January dip to 20 degrees. July temperatures reach an average high of 90. Annual rainfall is about 45 inches. Two public schools provide education for levels ranging from kindergarten through 12th grade. Higher education is served by the University of Missouri at Rolla, located an hour away, and Jefferson College in Hillsboro, 90 minutes from town. Reynolds County General Memorial Hospital and St. Francis Hospital are both located 25 miles from town and provide emergency medical aid. The Ozark National Scenic Riverways, comprised of the Jacks Fork and Current Rivers, is located largely within Shannon County. Born from an act of Congress in 1964, it is America’s first national park created to protect a river system. The Jacks Fork flows right through the center of town before its confluence with the Current River just outside Eminence. Beckoning caves, rock outcroppings, springs, hardwoods and limestone bluffs line the banks. With over 120 miles of navigable waters, you’re sure to get your fill of the best canoeing, kayaking, rafting and tubing. Swimming and fishing are popular pastimes, as well. However you choose to enjoy the scenic riverways, numerous venders and rental services are eager to help you with any and all of your equipment needs. 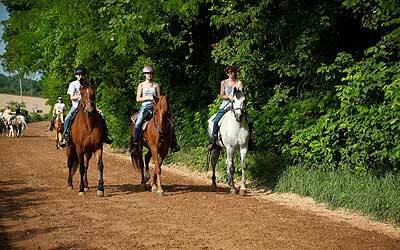 Located just a mile north of Eminence, Cross Country Trail Ride is the preeminent vacation spot for horse lovers. It features a 75-acre campground, kitchen and dining hall. The indoor riding arena boasts 63,000 square feet with a restaurant, western store and tack store. Of course, the trails are endless, but even if you’re not a riding enthusiast, you can cut a rug while listening to one of the Nashville performers who frequently grace the stage. You’re also welcome to swim and float in the Jacks Fork River, which surrounds the property on three sides. Our community also holds considerable intrigue for hunters. After a prolonged absence, elk are gradually returning to this area thanks to the Missouri Elk Restoration Program. The Missouri Department of Conservation launched the program in 2010 with the goal of reintroducing a population of these noble creatures to parts of Shannon, Carter and Reynolds Counties. Additionally, Eminence and the scenic riverways are home to a diverse collection of wildlife. Year-round family entertainment is only an easy drive away in Branson, MO. This country music mecca has become one of the most popular vacation spots in the U.S.A. In addition to the great shows, there is Silver Dollar City, which is an 1890s style theme park. Horse lovers come from all over the country every year to ride over the hills and enjoy the country. Thousands of acres of woods are included in the Mark Twain National Forest. In addition, golf, tennis and other sports are also popular in the area. For real estate in Eminence, Ellington, Winona and Birch Tree, Missouri, contact our United Country office. Whether you’re looking for outdoor adventure or a leisurely stroll through town, we’re the experts at finding that perfect property.